Mark Bennett is confident he is over his injury problems ahead of the rugby World Cup. 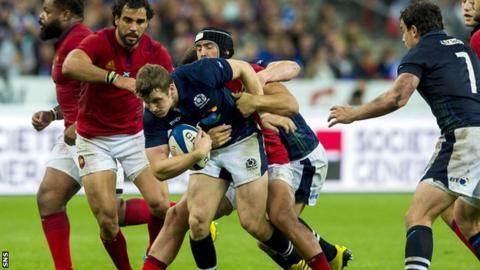 Bennet, 22, was a stand-out in Scotland's 19-16 loss to France in Paris on Saturday in Scotland's final warm-up match. "It was a stop-start season for me last year with a few injuries, but I always felt I was doing well when I did get started," said Bennett. "However, I feel strong now and I'm ready to rock and roll." The Glasgow Warriors centre said: "I never feared that I would not be back in time for the World Cup. I tried to stay positive and that helped. "I've recovered from injuries quickly in the past and I'm still young so I have youth on my side. In my head I knew I was going to make it and thankfully nothing has stopped me. Scotland went agonisingly close to ending their 16 year wait for a win in Paris after Tommy Seymour scored the opening try. Noa Nakaitaci took advantage of Scotland going a man down when David Denton was sin binned to edge France in front with a try of their own. "It was disappointing to lose in Paris because we played well in parts of the game," Bennett said. "We were under pressure on our own line and defended great. "But, unfortunately they managed to break through and get the winning try." Vern Cotter's side open their campaign against Japan, before facing USA, Samoa and pool favourites South Africa. Bennett said: "The satisfying thing, though, is that we came out the back of that and pushed forward. And right up until the dying seconds we looked capable of winning. "We put ourselves in strong positions so there are a lot of positives to take into the World Cup."